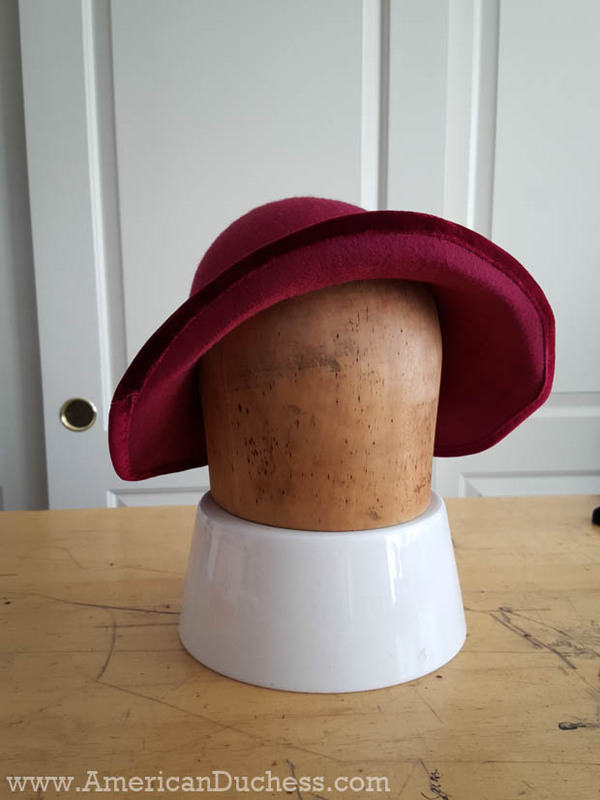 It pales in comparison to the original, but I'm quite happy with my burgundy Miss Fisher hat, retro-cycled from a sad garage sale find. So far I've made trousers, a blouse, a skirt, several cloche hats, and have bought some blouses too. I don't claim to have any hat-making expertise beyond the one enlightening class I took at Costume College a couple years ago, but I do enjoy the sculpty-organic craft with my limited skill and supplies. Of all the cloche hats I've made, this one was the most challenging because I wanted a nice arced brim, but needed to create it all-in-one with the crown. Happily, it wasn't as tough as expected, just took some careful trimming and pressing. I was surprised that the quite-small hood was able to produce a large enough brim to mimic the inspiration hat rather well. 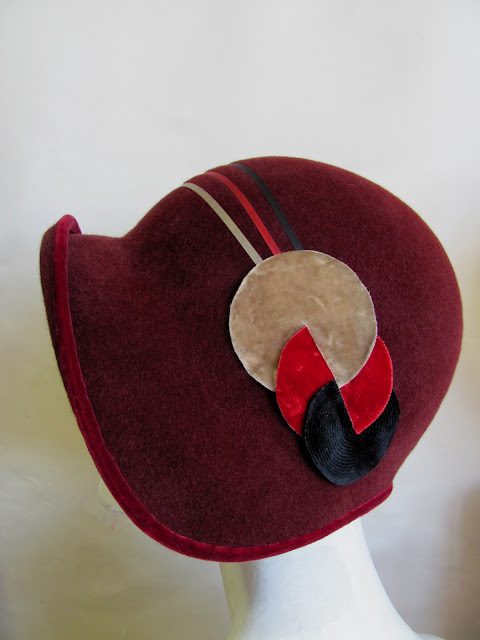 I bound the un-wired brim in a burgundy velvet and stitched felt circles onto the side, like the inspiration. 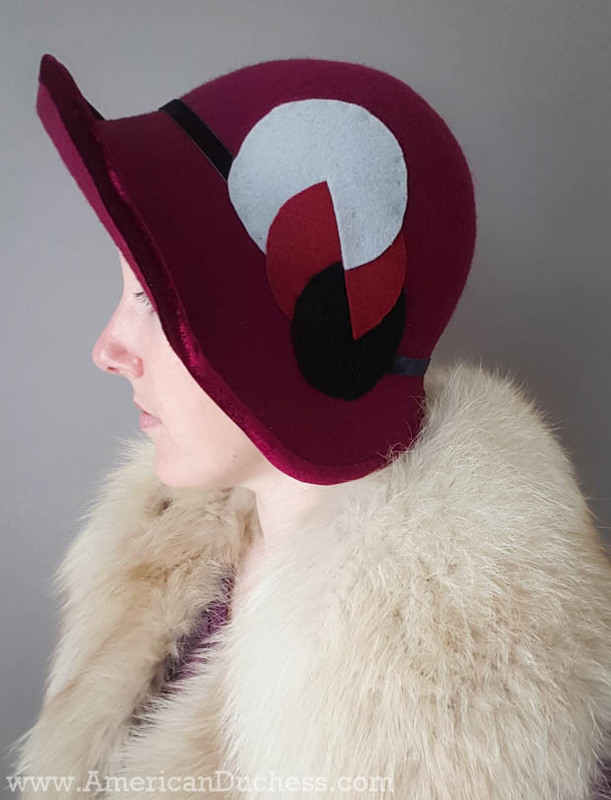 Mine definitely has a home-made look (I should at some point upgrade my circles to nicer materials), but women often re-shaped and decorated their hats in the '20s, so I don't feel bad at all about it. And the best part? It goes with all the other pieces, current and planned. I really love this mix-and-match aspect. It makes dressing so easy, but also interesting enough to not look like you're wearing the same thing every day! That looks great! will you be wearing an Miss Fisher ensemble to Costume College? A call on this would be fun. I'm toying with the idea of a Mac costume during the day on Fri or Sat, I have pretty much all the pieces I'd need already in my wardrobe! 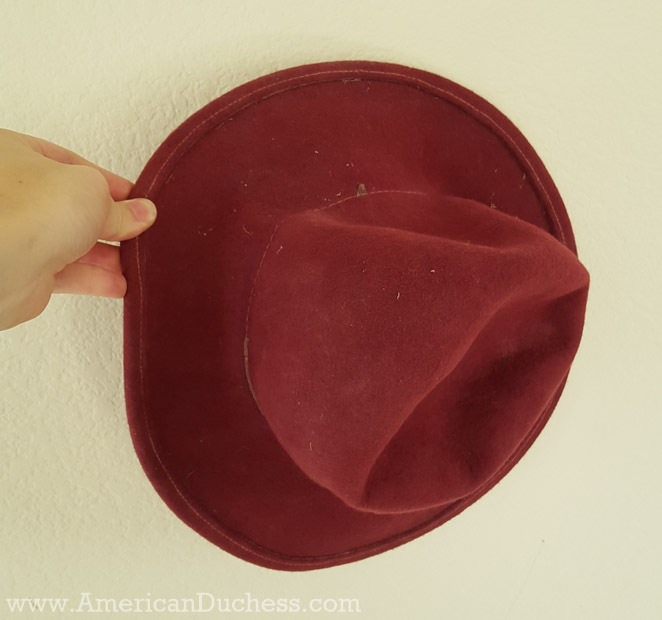 I am bummed that I THREW OUT an old felt hat. If I'd seen what your soak could do, who knows what nice little cloche I might now own??? Fantastic transformation. The colours here are so richly elegant and timelessly pretty. Awesome work, lovely Lauren!